Current applications of GiD in computational fluid dynamics cover a wide range of external and internal flow problems such as ship hydrodynamics, aerodynamics of buildings and vehicles, analysis of fans, mould filling problems, etc. 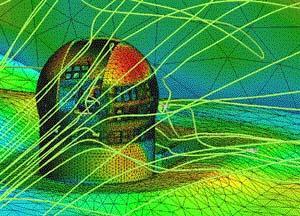 GiD includes all the necessary facilities for generating structured and non structured meshes in complex geometries, as well as for visualising the flow features of interest such as velocity and pressure contours and line plots, velocity vectors, particle lines, stresses at solid boundaries, etc. 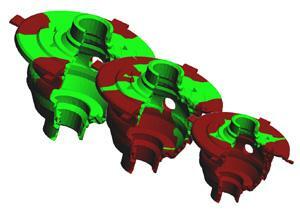 Analysis of a mould filling process. The simulation was run using Vulcan solver. Aerodynamic analysis of the new large telescope facility in La Palma island, Islas Canarias, Spain. The simulation has been run using Tdyn solver. CFD analysis of sea landing of a space vehicle, focusing on getting the presure of the water against the vehicle. 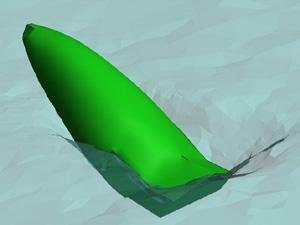 Hydrodynamic analysis of the Spanish America´s Cup racing sail ship. The simulation has been run using Tdyn solver. 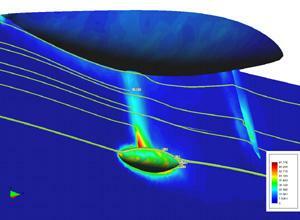 Results from a FSI simulation for analysing the wave impact on an off-shore platform. The simulation is done using Kratos. Animation of the results using 3D stereoscopic view in GiD.